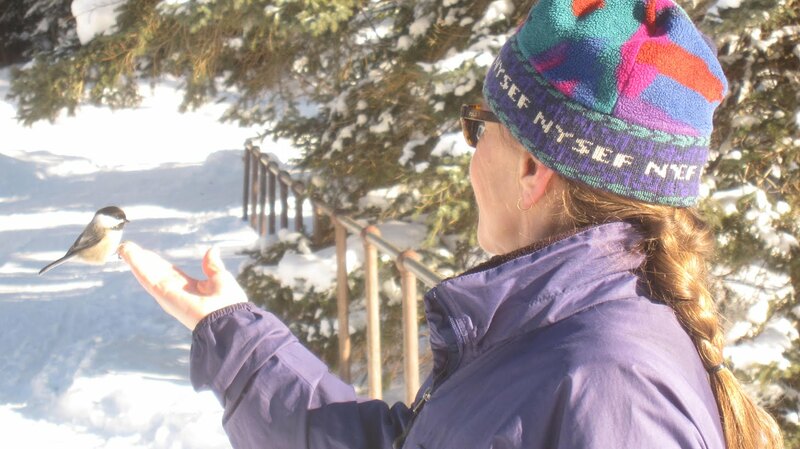 One can never predict exactly what will happen on an Adirondack backcountry ski excursion. 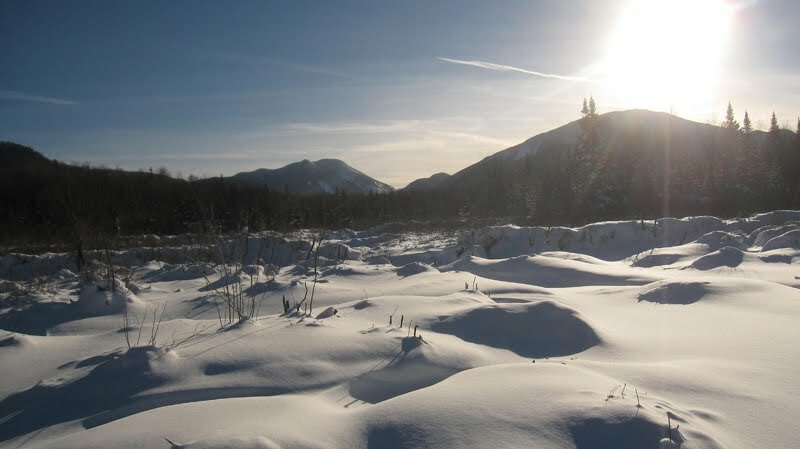 The expert backcountry types recommend those who venture in to the Adirondack backcountry are wise to be prepared for anything. 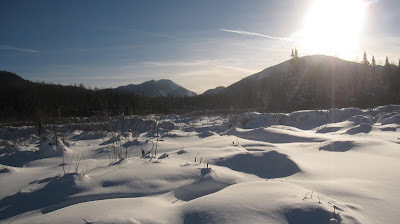 Fortunately, it was in the spirit of 'ready for anything' that I set out with the resident biologist and navigator, my husband Ed, for a quick and simple backcountry ski to Marcy Dam via the hiking trail that originates at the Adirondack Mountain Club's facilities at the end of Loj Road. I say quick and simple because we have skied this route countless times over the course of the last 25 years. This particular route is considered my standard no-brainer, relatively easy ski trip with great downhills and awesome views. Not this time. 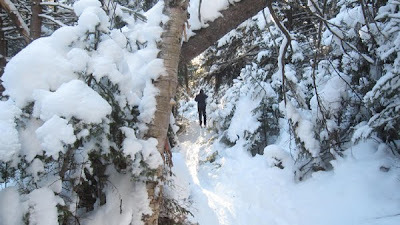 Although the Marcy Dam Truck Trail had plenty of snow coverage a few weeks ago, the hiking trail was another story at that time. The mostly uphill trail from the Adirondack Loj to Marcy Dam was excruciatingly rough and difficult to ski, with the simple herringbone climbing technique made difficult by the exposed log stairs and large boulders. By the time we arrived at Marcy Dam, I was exhausted and whining about the prospect of my broken body from the return trip down log stairs and over large rocks, albeit on skis, my favorite mode of transportation. The chickadees at Marcy Dam and the navigator extraordinaire's idea to take an alternate route back to the Loj cheered me up. The alternate route back to the Adirondack Loj, where our car was parked, was a risk. Ed reminded me because the Marcy Dam Truck Trail is maintained for emergency vehicular travel and did not harbor exposed log stairs and large boulders, it was in great ski condition. 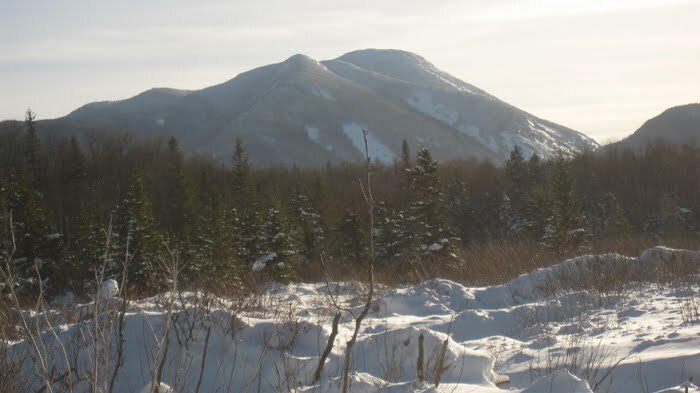 We could easily ski the Truck Trail, pick up another old trail, the Mr. Van Ski Trail and take it across to the Adirondack Loj. 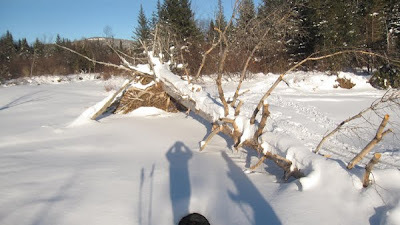 The risk involved getting from the Truck Trail to the Adirondack Loj via the Mr. Van Ski Trail, on which we had not skied in many years. This section of the Mr. Van Ski Trail is known for swampy beaver ponds and the absence of a clearly marked route. After a very brief consideration of the alternative, I decided to 'be prepared for anything' and take a risk. After enjoying the expected and still delightful, tuck-n-go, cut-it-loose downhills on the Marcy Dam Truck Trail, we encountered the Mr. Van Ski Trail where it crosses the Marcy Dam Truck Trail at approximately 2.3 miles from Marcy Dam. We took a deep breath and headed into the wetlands. Our sense of adventure was rewarded with the pleasant surprise of a very well marked ski trail that crossed over frozen beaver ponds and through the stunning snow covered balsam forest replete with incredible mountain views. After an additional 1.3 miles on the Mr. Van Ski Trail, we arrived happy and unbroken at the Adirondack Loj parking lot. Photographs courtesy of Ed Reed.